Another flashback to my days in Spain...I do not miss bocadillos, but there are some things I wish I could go back to Madrid to experience. Have you been to Madrid? Spain? What do you miss about it there? What did you miss from home while you were there? 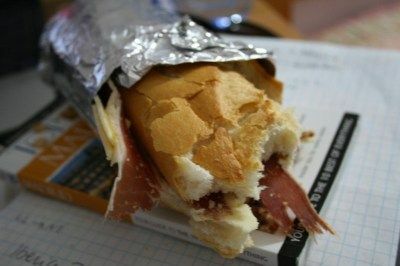 I just thought I should post a good picture of one of the bocadillos of which I am growing so fond of. I don't think I'll ever like the jamon here though. Jamon York is what I prefer (which means the kind of ham that we--meaning people from the US-- eat on sandwiches). The jamon they eat here is smoked or something instead of cooked. It will be funny if I end up missing bocadillos. The thing is, I'm pretty sure if you give me a BLTA from Red Robin, I will forget all about bocadillos. Boca-what?? So I'm definitely a country girl, but that doesn't mean I like George Strait.